Fantasy Flight Games veröffentlicht eine neue Karte für Imperial Assault: die Endor Defense Station Map. The battle between the Rebel Alliance and the Galactic Empire spans countless worlds. Your adventures have taken you from the back alleys of Coruscant to the once-fertile fields of Lothal. Now, it’s time to venture to the forest moon of Endor for a new conflict! Fantasy Flight Games is proud to announce the Endor Defense Station Skirmish Map for Imperial Assault, available now for pre-order from your local retailer! 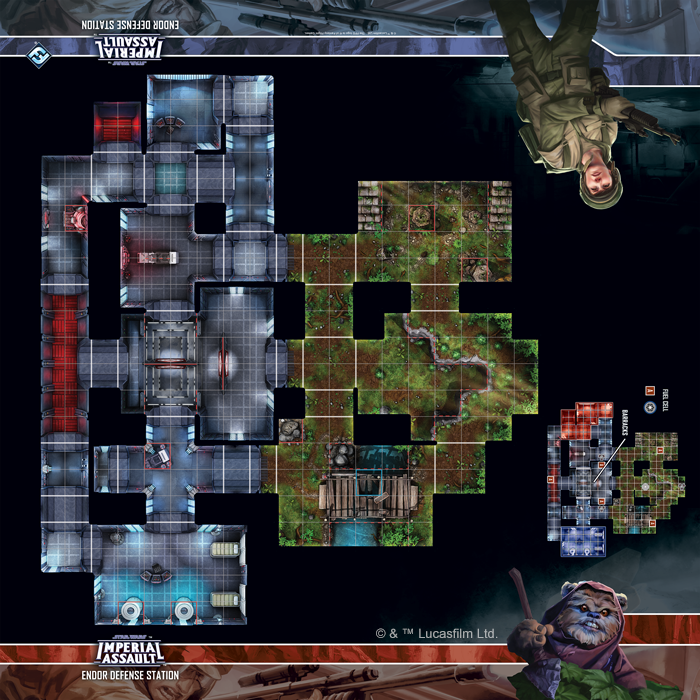 The Endor Defense Station Skirmish Map is a 26” x 26” slip-resistant mat for use in your Imperial Assault skirmish games, making setup quick and allowing you to jump right into the action with a pre-constructed map. Ich versteh solche Designentscheidungen immer nicht. Solche Beleuchtungseffekte und das Bling sind doch kein StarWars-Look und schon gar nicht das visuelle Feeling von Return of the Jedi.